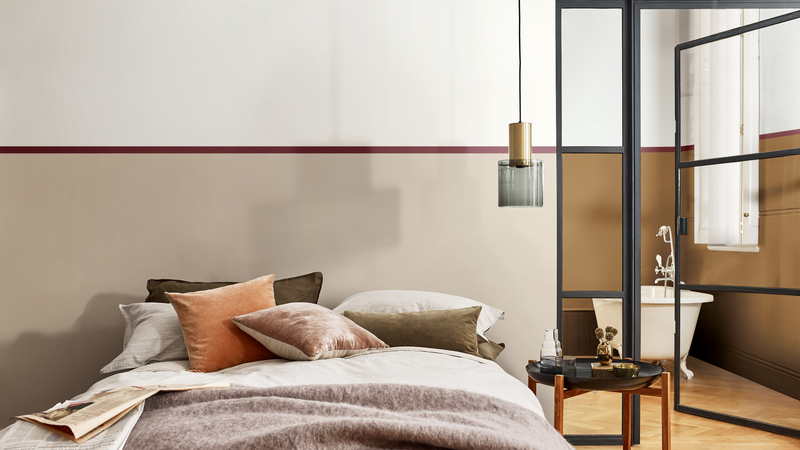 In the bedroom above, an elegant mix of warm neutrals, with the rich tones of Creme Brulee at its heart, sets up a mood of calm and contemporary comfort. Mid-century modern furniture and brass and copper detailing give an edge that is contrasted with tactile velvets and soft knitted fabrics. 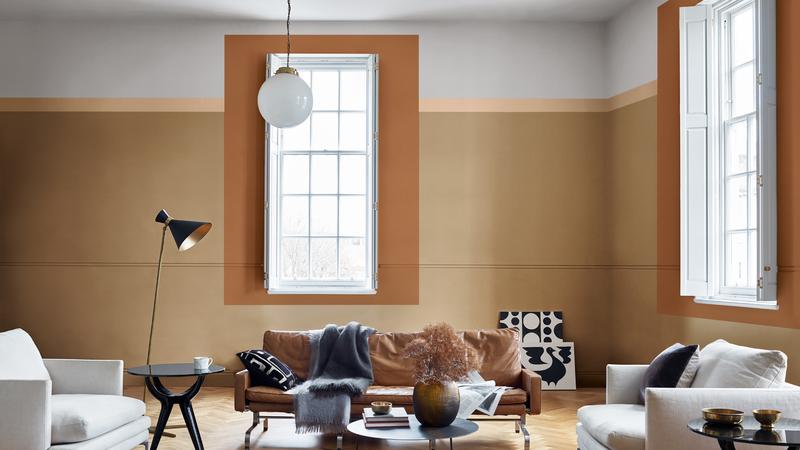 In this sophisticated living room, Creme Brulee, Dulux Colour of the Year 2019, makes a strong statement with its almost glowing amber tones, emphasized by the complementary warm neutrals that are used around the windows and to create a border next to the pale grey ceiling. Warm tan leather and graphic art and objects add to this striking look. This bedroom – perfect for an older child – creates a relaxed atmosphere that’s equally suitable for study or calm contemplation. 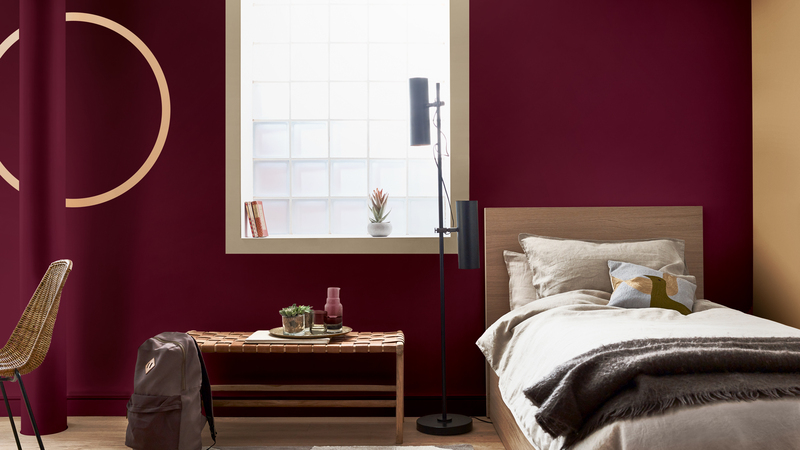 Rich burgundy sits beautifully with warm neutral accents including Creme Brulee, Dulux Colour of the Year 2019, while a graphic circle shape painted on the wall makes a cool talking point. Woods, leathers and knits bring a tactile feel to the room. 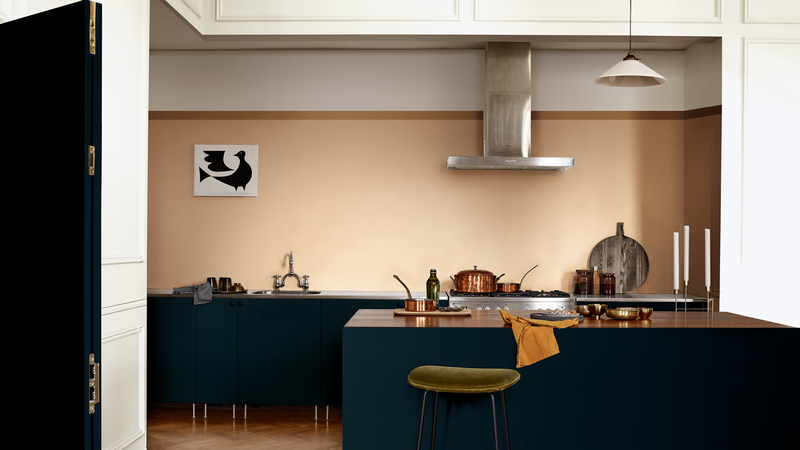 This kitchen creates subtle drama which lies in the contrast between its offbeat shades. From the intense charcoal-blue of the cabinets, to the neutral-pink of the walls and the versatile Creme Brulee that here takes on a golden tone in the slender stripe near the ceiling. Graphic artwork and copper accessories complete this quirky but refined room.